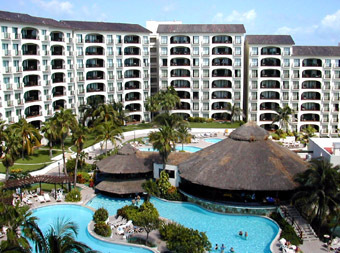 In November 2001 we did a timeshare exchange into the Royal Mayan Resort in Cancun, Mexico. We had a full two-bedroom unit at this timeshare, so we invited our "vacation buddies" Scott and Karin Cerasale to join us from Florida. 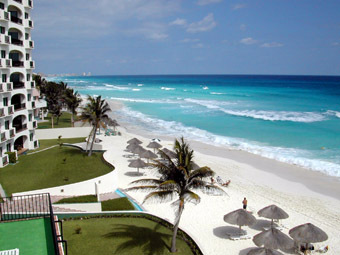 The weather had us worried in the days preceding our vacation, because Hurricane Michelle was moving towards Cancun. But the storm turned eastward in the nick of time, and the rain stopped the day after we arrived. The weather was gorgeous for the rest of our stay. 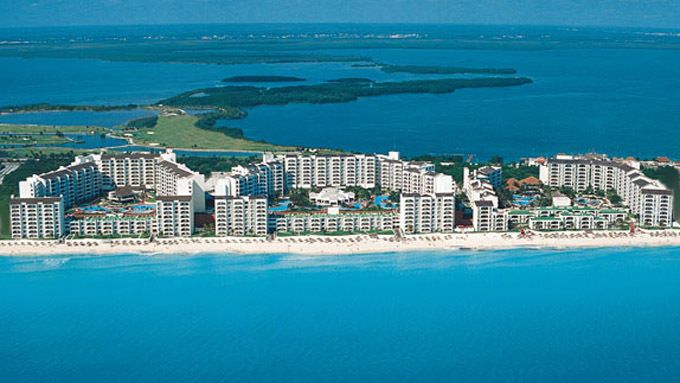 This aerial view shows the three "sister resorts" (the Royal Islander, the Royal Caribbean, and the Royal Mayan), located on the beach in the Hotel Zone of Cancun. 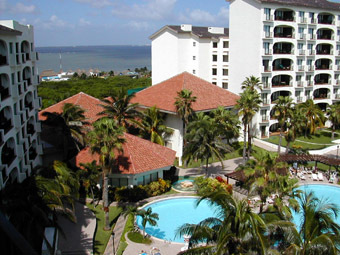 There is one more associated resort (the Royal Sands) located a few miles north. When staying at one resort, you are free to use the many amenities of all the resorts, and a shuttle bus constantly runs between them. This is the view looking west from the roof deck of the southern building. The tile-roofed buildings contain the lobby, El Conquistador restaurant, grocery market, and Computer Center. And this is the view looking north from the same place. 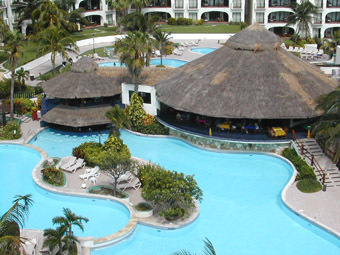 The thatched-roof buildings are the Palapa restaurant & the Pool Bar. 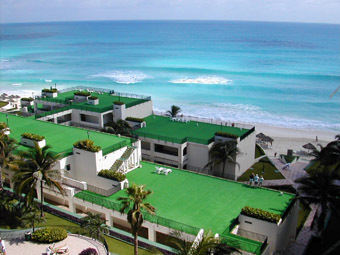 This is the view looking east toward the ocean, over the top of the low oceanfront buildings (where our unit was located). Here's one last view from that rooftop, looking down on the pool area. Here's the view from those oceanfront buildings, looking northward up the beach. And here's the view looking southward down the beach. 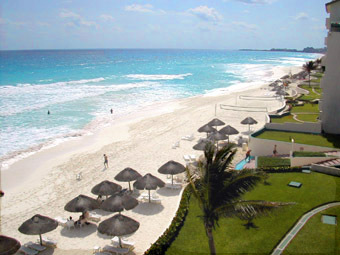 Enjoy affordable Cancun vacations with your friends and family.